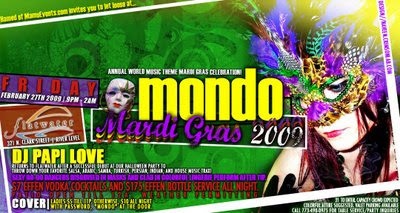 Annual World Music Theme Mardi Gras Celebration! DJ Papi Love returns to Flatwater after a successful debut at our Halloween party to throw down your favorite Salsa, Arabic, Samba, Turkish, Persian, Indian, and House music trax! Free Beaded Necklaces at the door. Free Masks to first 50 ladies! Patio open till 12a, weather permitting. COVER: Ladies $5 till 11p. Otherwise, $10 all night with password, "Mondo" at the door. 21 to enter. Colorful attire suggested. Valet parking available. Call 773-490-0975 for table service/party inquiries.